I have read that most interesting article in the Veteran in regard to General Tilghman. General Tilghman was a most daring, dashing, splendid officer, and we were often fearful that he would be killed. I belonged to Cowan's Battery of Vicksburg, Miss., referred to in the sketch. I was the gunner directing and sighting the gun at the time by the advice of General Tilghman, who had perfect knowledge of the situation of the enemy through his field glasses. His last words to any one were in the highest compliment to me, praising my excellent marksmanship, except the words he spoke as he fell from his horse after a three-inch rifle shot had cut him nearly in two, and as he careened and fell he said to his son, who caught him, "Tell your mother; God bless her." He was at that time near my guns, but had turned to ride down the line and was fully exposed to the fire of the enemy from small arms as well as a splendid battery that we had been dueling with for at least half an hour, and under his directions, we had silenced it. Any one that was there will surely recollect that the entire line was driven back almost in our rear, and we held every inch of the ground until sundown, and this we did because of the wonderful encouragement and splendid management of this gallant chieftain who gave his life for our Southland. The stone that has been placed at the spot where he fell marks not only the ground stained with his blood but also marks the spot where Cowan's Vicksburg Battery did such fine execution under his direction. After his death that line was so neglected that the enemy had almost cut our retreat off from Vicksburg. We were huddled that night in the creek bottom and were forced to abandon our guns. Part of Loring's Division went into Vicksburg and part of it went out with General Loring. Our battery was divided, part of it following First Lt. George Tompkins, the other part following Captain Cowan into Vicksburg. We were all in darkness and disorder, and hardly knew what we were doing or who we were following until late the next day. Had this splendid officer lived, Loring's Division would have gone into Vicksburg in good order with the balance of the army that met the Yankees at Baker's Creek. His death at that time surely was a great shock to all of us, and no men ever felt the loss of a commander more than we did then. 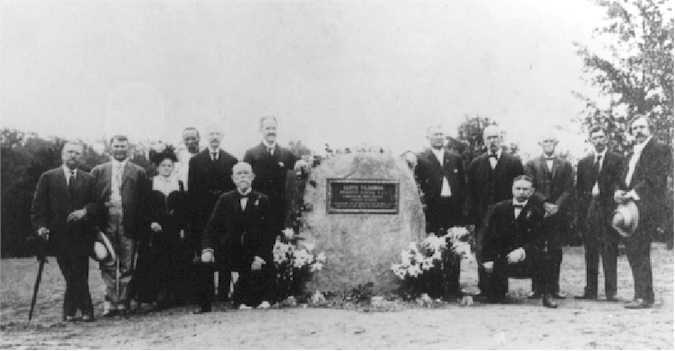 Photograph circa 1907 at the dedication of the monument to Brig. 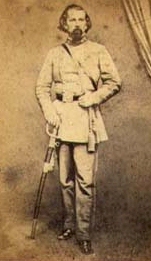 Gen. Lloyd Tilghman on the Champion Hill Battlefield. The site is located near the Coker House. Kneeling to the right is one of General Tilghman's sons who spearheaded the memorials - both at Champion Hill and the Vicksburg Military Park. Mrs. Sidney Champion, plantation owner, is pictured to the left of the monument.